Follow the recommendations in the Maintenance Guide. It is recommended that you use products approved by CITROËN. Screenwash fluid reservoir: 3.5 litres. Screen and headlamp wash reservoir: 6.5 litres. To ensure optimum cleaning and to avoid freezing, topping up or filling of the reservoir must not be done with just water. The coolant level should be between the MAX and MIN marks on the header tank. If the engine is hot, wait 15 minutes. 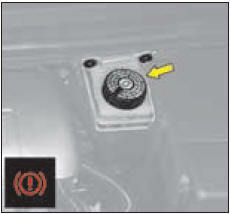 Quality: See "Maintenance Guide"
Never work on the cooling system if the engine is hot. Check the oil level with the vehicle parked on level ground, after the engine has been switched off for at least fifteen minutes. Quality: See "Maintenance Guide"
It should never exceed the maximum mark. The fluid level must be situated within the MAX and MIN marks visible on the reservoir. The screenwash fluid should be replaced periodically as it loses its effectiveness over time. 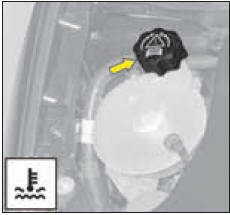 Quality: See "Maintenance Guide"
If the warning lamp comes on while you are driving, stop immediately and contact the CITROËN network. When working under the bonnet, when the engine is hot (even stopped and the ignition switched off), the cooling fan could operate at any time. Check the engine oil level frequently between routine service visits, as well as prior to long journeys. The coolant must only be checked or topped up if the power unit is cold. As the cooling system is pressurised, wait for at least one hour after switching off the engine before intervening. To avoid the risk of scalding, slacken the cap two turns to allow the pressure to escape. Once the pressure has fallen, remove the cap and top up the level. The coolant level should be between the MAX and MIN marks on the header tank. Top up the level. If you have to add more than 1 litre, you should have the cooling system checked by CITROËN. Note: The necessity to top up frequently would indicate a malfunction that should be checked at the earliest opportunity. Note: On vehicles equipped with a particle filter, the cooling fan may operate for some ten minutes after the engine has stopped. Remove the dipstick before topping up. Check the level after filling. Screw on the cap before closing the bonnet. Quality: See "Maintenance Guide". Check and top up at regular intervals. The fluid level must be situated within the max and min marks visible on the reservoir. If the warning lamp comes on when driving, stop as quickly as possible and contact a CITROËN dealer. The synthetic fluid not only gives protection against corrosion but also ensures correct functioning of the braking system in all environmental conditions, therefore you should only use the synthetic product recommended by the CITROËN network. (this fluid must be replaced every two years). These important requirements are detailed in your vehicle’s Maintenance Guide. Quality: See "Maintenance Guide". When working under the bonnet, when the engine is hot (even stopped and the ignition switched off), the cooling fan could operate at any time. The rate of wear of the brake pads depends on the use of your vehicle (urban use, frequent stops), and on your style of driving or the type of journey. For information on checking the discs and drums for wear, contact a CITROËN dealer. After washing the vehicle, brake progressively to dry out the brake linings.